Image caption Left, Katie's hair in June 2017. Right, the effect her recent treatment has had up to October 2017. "There isn't, at the very early start, anything that's noticeable." But after a while bald patches are visible, often around the crown of a person's head. Depression and anxiety follow. That happened to Katie Hawthorne, who started pulling her hair out when she was 15. She's one of 840,000 British women who suffer from the hair-pulling disorder trichotillomania (TTM). It is often caused by stress and anxiety. Katie, an artist from Livingston, West Lothian, has documented her condition by taking photographs of herself. 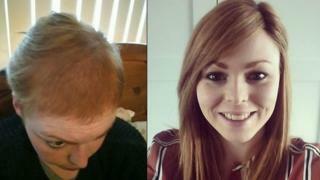 Now 27, she has been suffering from trichotillomania for about 12 years - "as far back as I can remember". After falling in an accident aged 15, Katie's confidence plummeted. "I smashed my teeth through my face", she told Radio Scotland's Kaye Adams programme. "It left me with a big scar on my face, underneath my nose. "Being at high school, and the stress, and being nervous about the way I looked and everything, that's what triggered it to happen." For consultant trichologist Carol Walker, a hair and scalp specialist, the way Katie's TTM began is typical. "It's a kind of self-harm...it starts with emotional or physical trauma to the individual. "You can go through school, bullying or snide remarks can make you feel not worthy...it becomes this obsessive compulsive behaviour. "There isn't, at the very early start, anything that's noticeable", Ms Walker explained. "The more someone pulls away at their hair, the weaker the follicle becomes. Eventually, it becomes a permanent hair loss issue." Katie managed to hide her condition from friends and family for a few years. When she was a younger teenager, she pulled her hair out from underneath, meaning it was easier to hide from people. "I'd hidden it quite well for a long time" she said, "but [when I was 18 or 19] I'd progressed to where it started going to the sides of my hair and the top, whereas before I could hide it a lot better." Katie's mum was the first to realise what was happening to her. She had been reading and researching online after her daughter had finally told her about her hair loss - it had "become obvious at that point". But when the teenager first went to her GP to seek advice, she was left disappointed. Katie said: "They hadn't even heard of the condition, so I sort of felt a bit rubbish about that". Despite counselling, she suffered from the effects of TTM for several years, including hair loss and low moods. She then dropped out of university and was diagnosed with depression and anxiety. "I had become a hermit for six or seven years, I didn't leave my bedroom." Last year, aged 26, Katie found the "only thing that's helped" her TTM. She had a mesh-like system of extensions placed in the roots of her hair at Lucinda Ellery, a specialist hair loss clinic. The mesh lets the hair grow and stops the root from being pulled out of the scalp. It has to stay in place for two years. "There's quite a lot of psychological and emotional building that goes on in that particular time, of helping people change the way they think....they feel different, and they begin to look it", said clinic founder Lucinda Ellery. She suffered from a form of hair loss herself when she was a child. Consultant Carol Walker also has methods of dealing with her clients' TTM. "Everybody is different. Some people work well with having a different hairstyle", she said. "Sometimes it's just sitting and taking to them." She also refers some patients on. For Katie, the treatment seems to be working. "My mum said the first time she saw me I was just oozing confidence," she said. "I haven't pulled my hair out since I've had it on. It's made me feel 100% better...I have a new day job now."